Maybe you’re like me. There was a time when the thing to wear when going outside in the winter was the thickest, biggest parka you could get. But you’d get hot and have to unzip it. Then, you’d zip it back up, followed by rinse and repeat. Not so with layering clothing. Layered clothing is the smart way to dress when going outdoors no matter what the weather. You can say the same thing when it’s rainy—especially if you’re wearing a coat that doesn’t breathe. Let’s run down what you need to know to make you more comfortable and safer when trying to stay warm and dry outside. The primary concern is hypothermia. And it’s more than just getting a chill. It can get dangerous, really fast if you don’t do something about it. If you’re out in a remote area, you may have a hard time getting back to civilization. It’ll tap your energy and leave you confused. That can lead to bad choices and risk-taking. Not good stuff. If it gets worse, you could pass out, and then, you’re talking frostbite, gangrene, and eventually the D-word. Talk about a buzz kill. The term means wearing several articles of clothing instead of one large one. The idea is simple. That little bit of space in between each layer traps some of your body heat. You can think of it as an insulated cup. That extra bit of warmth keeps the liquid, or in this case, your body, at the right temperature. It also gives you flexibility. 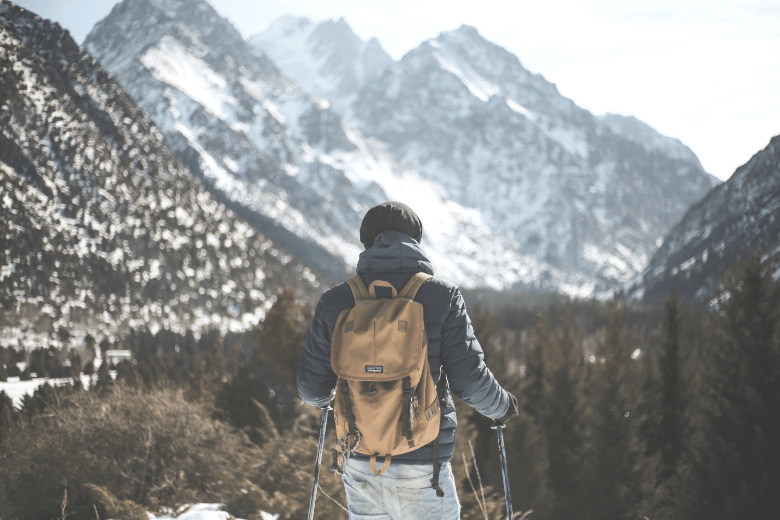 If you’re active outdoors, your body will heat up fast, making that heavy parka more of a hassle than anything else. Or if the weather takes a pleasant turn, you can shed a layer and still stay comfortable. The good news is that we’ve come a long way on that score. There are technical materials that take it to the next level. The rule of thumb is three layers, though, you may add or subtract one depending on the season, conditions, and your tolerance. For me, I like being a little chilly instead of hot. But what works for me may not be the best choice for you. Each one brings something to the mix. Let’s talk about each one. It is the one closest to your skin. You want it to be soft so that it doesn’t chafe, but the function is important too. It has to provide some warmth. And it must also wick away the moisture that can lead to hypothermia. After all, sweating and freezing temperatures don’t mix. I’ll tell you straight up to nix the cotton. Sure, it feels comfy, but it’s not going to keep you dry. And if you’re bushwhacking through some thick woods, you’ll get uncomfortable fast. Better choices are materials like merino wool or polyester from the synthetic camp. They’ll get the job done right. The first one does a decent job at wicking and a stellar one at keeping odors in check. The second one is best for keeping you dry but may start to get ripe after a punishing workout. You can opt for silk, but it’s not the ideal choice for either purpose. Check out the weight of the fabric and its fit too. I like looser shirts myself instead of the ones that cling to you. The purpose of this one is to keep you warm and provide that vital insulation. You can go with something thicker here, again, depending on the conditions. One thing you have to keep in mind is that whatever material you choose will get damp. Your base layer can only do so much. It’s one area where synthetic fabrics have the edge over natural ones like down. They dry quickly. And that’s huge. But, it’s not a knockdown match. Sure, fleece keeps you warm and dry. The one thing it doesn’t do well is keeping you toasty in windy conditions. A cold north wind will slice right through it. On the other hand, synthetic materials are breathable. That goes a long way to keep you from overheating which isn’t fun either. You’ll see a lot of technical fabrics as I mentioned before. Expect to pay up for the performance-grade clothing. The outer layer or outer shell is your first line of defense against wind, rain, and snow. If you opted for fleece for the middle, it’d give you that extra protection to keep you warm if it’s breezy outside. It’s another area where you’ll see those high-end materials—with their similar price tags. There are two camps, water-resistant and waterproof. Either are breathable or non-breathable. Water-resistant materials will suffice if it’s raining or snowing lightly, and you don’t plan on being out long. The breathability part comes from the tightness of the weave of the fibers. They’re an excellent choice if it’s windy, especially with the non-breathable fabrics. You will stay dry. But you’ll also sweat. Waterproof shells are the crème de la crème of the outerwear world, particularly the breathable ones. Not only will you stay dry, but you’ll feel comfortable too. These are the kind of products that the guys from the Weather Channel wear when covering hurricanes and tropical storms. A third choice that you may see are soft shells. They combine the functions of the middle and outer layers with breathability. They offer an excellent option for layering clothing during warmer times of the year when three is overkill. Unlike the other layers, you’ll likely find that the outer one has extra bells and whistles that separate the okay products from the high-performance ones. They run the gambit of materials to closures to additional protection for your noggin. If you don’t like to wear hats, at least pick a shell with a hood. An adjustable one is essential if you wear it while biking, caving, or any other activity that involves wearing a helmet. And take the time to make sure it fits before you go outside. Rain sometimes starts suddenly like a faucet. Look for a product with a drawcord, preferably on the bottom. That will keep cold air or precipitation from stealing your warmth. Check out the cuffs too. Many shells have Velcro tabs to get a tight fit. That’s essential if you wear a smartwatch or fitness band. Not all of them are waterproof. I like an outer layer with vents to allow for some air circulation, especially under my arms. Many waterproof shells have them as a compromise between dryness and comfort. The stitching and positioning keep rain and snow out while doing its job to prevent overheating. Of all the layers you buy, expect to pay the most for this one. I’d suggest getting the best one you can for your budget. Don’t skimp on something that can make the difference between a great outing and one you’ll regret. Often, you’ll see these products with a satisfaction guarantee or even a warranty. Read the terms and take it back if it’s not what you want. As the saying goes, don’t throw good money after bad. Manufacturers will stand behind their products if there are defects in the workmanship. Things like leaky seams are examples of things that can go wrong for a replacement. All play a role in the big picture. Let’s discuss each one and how they affect your choice of layers. That’s the big one, especially when it comes to performance. Consider the conditions both outside and inside of you. If you’re always cold, you’ll dress differently than someone who has shorts on in the winter. It affects your choice of layers when it comes to weight and thickness. More of either one means more warmth. Another option for when it gets chilly outside is to have a fourth layer. That will work if the inner ones are lightweight and don’t constrict any movement. I’d recommend choosing fabrics that wick moisture well if you go this route. This factor is most important when it comes to your outer layer. Choose wisely if snow or rain is in the forecast. And remember you can always take it off when the weather clears. Keep both of these things in mind when layering clothing. Dry is nice but not if you’re uncomfortable because you’re too hot. It’s one situation in which you’ll appreciate the difference between a waterproof versus a water-resistant shell as well as its breathability. That is what separates a high-quality outer layer from one that isn’t the same caliber. Your layers will need to step up their game if you’re not moving a lot. Likewise, breathability is essential if you’re cross-country skiing or snowshoeing. There’s a reason why you’ll burn over 500 calories an hour doing either one. And that’s a lot of heat. It also factors into your choice with the fit. Look for looser clothing or ones with stretch panels at strategic locations. It all comes back to you and your preferences. Everyone wants to have a good time when they’re outdoors. The clothing you wear has a significant impact on the outcome. And it’s why layering is the best way to ensure you stay comfortable. Conditions inside and around you vary considerably. What is it that they say in Minnesota? If you don’t like the weather, wait five minutes. Layering gives you that flexibility. The layers only go so far. You’ll also need to consider your hands, feet, and head. You can use layering here as well. You’ll find it necessary during extreme weather to give you that extra boost of warmth. For your hands, you can use glove liners which are lightweight but stretchy enough not to constrict blood flow. That’s essential because adequate circulation is crucial to prevent frostbite. The same concept applies to your feet. The extra layers function the similarly by trapping your body heat. Likewise, you can wear a cap under your hood. I prefer wearing the hood alone unless it’s really frigid outside. I like being able to hear what’s going on around me. Wearing a hat or earmuffs blocks the ambient sound. I can’t stress enough how important it is to pay attention to your body temperature, especially during the winter. As I discussed early, hypothermia is a serious condition. Fortunately, you’ll notice symptoms such as shivering before things get bad. If that happens, seek shelter as soon as you can. If your hands or feet get cold, follow the same advice. Frostbite is just as serious and painful if it goes too far. Take the time to read the care instructions for everything you buy. And make sure to follow them. I usually do it before I lay down the cash to make sure I’m not getting something that requires dry cleaning. That’s more trouble than it’s worth, I think. Performance materials need special care. For example, you may need to refresh the coatings on waterproof shells after a while. A wash and a quick once-over with an iron will bring it back good as new. 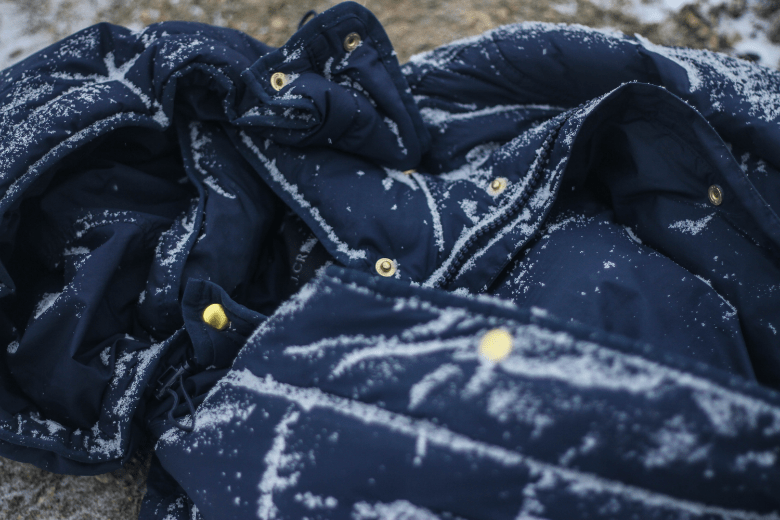 Likewise, down jackets need mild detergents to keep them fluffy and clean. Handwashing your clothes is always an option too, especially if you have a top-loading washing machine. They are often brutal on delicate fabrics. You might want to give it a pass with other materials such as down too. Layering clothing is an excellent way to stay warm while remaining flexible to changing weather conditions. And why you may not think of them this way, they can keep you safe too. The great thing is that you can swap out any of them to match what the forecast is dishing up before you leave home.